In May we went on holiday to the beautiful island of Majorca, somewhere I visited myself when I was younger and enjoyed re-visiting with my own family. We had a wonderful week in the sun and I know that we will definitely return again one day as it is the perfect destination for a holiday with children. It has a short flight time of just two and a half hours from the UK with daily flights and lots of hotels and resorts to choose from. 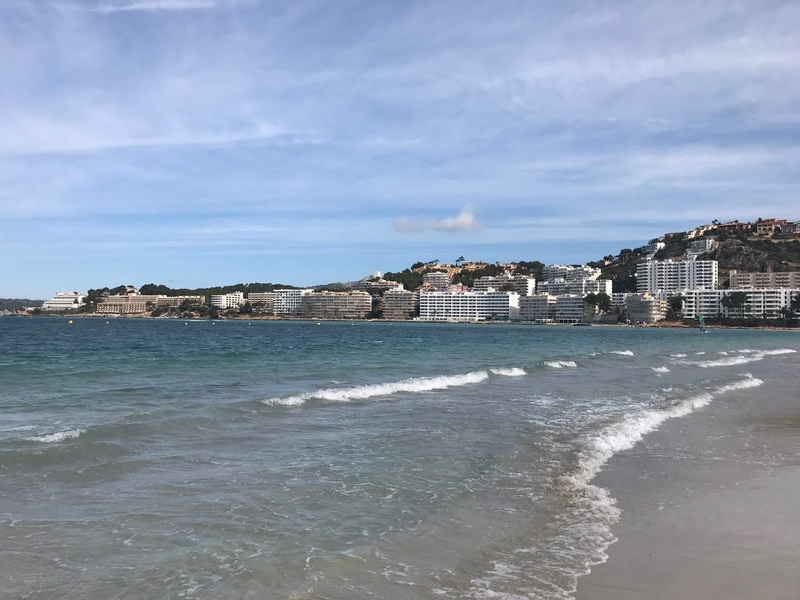 I have been to the popular resorts of Alcudia and more recently to Santa Ponsa and have also visited Magaluf and Palma Nova for days out. It is somewhere that I don't think I will ever get bored of visiting as there is so much to see and do. So what are the must-see sights in Majorca? 1.) The beaches - Majorca is home to some beautiful beaches, think golden sand and warm, shallow, clear blue sea. The beaches really are lovely and you can't beat paddling or swimming in the lovely warm Mediterranean sea. A lot of the beaches have padelos, bars on the beach and boat trips but some of them are secluded and quiet little bays that are perfect for relaxing in the sunshine. 2.) Caves of Drach - One of the most popular attractions has to be the Caves of Drach, we didn't visit on our recent trip but I have visited in the past and they are breathtaking. The caves look amazing all lit up and the musical boat concert is not to be missed. 3.) Pirate show - The Pirate adventure show in Magaluf is amazing, it is an evening show that entertains the whole family. They have a family-friendly show and then an adult only showing and you can book bus trips to the show from most resorts on the island. The show is action-packed and lots of fun, you also get a meal during the show which was chicken, wedges, coleslaw and bread rolls plus unlimited soft drinks, beer or sangria. It is a brilliant night and I highly recommend it. 4.) Palma Aquarium - We didn't visit but I think we will next time we go to Majorca as lots of people have recommended we visit. Palma aquarium has one of the deepest tanks in Europe and has a whole host of sea life creatures, from sharks to turtles and jellyfish. You can go on a boat across the shark tank or watch them get fed and they even have a park for little ones. 5.) Visit Palma - Palma is the capital of Majorca and it is a lovely place with lots of shops, places to eat and is also home to the historic cathedral. It is a lovely place to explore and you can get buses from all over the island into Palma really cheaply. 6.) Boat Trip - There is a whole host of boat trips you can go on in Majorca, from glass bottom boat trips to sunset cruises and even sightseeing ones to popular Andratx market. If you are staying in or near Santa Ponsa then the Dragon Island trip is not to be missed as you visit a little island covered in lizards and enjoy a traditional Spanish lunch on board the boat. 7.) Water Park - Western Water Park near Magaluf is lots of fun, they have high white-knuckle slides, they have a kid zone for young children, a wild river and it is fun for the whole family. You really can't beat a day out at the water park when it is nice and hot. 8.) Train to Soller - You can ride the old-fashioned wooden railway train from Palma to Soller which is a beautiful, traditional Spanish town. The train takes you through some stunning countryside and then you can take the tram down to the port and spend a few hours exploring Soller before returning to Palma. 9.) Katmandu - We had planned on visiting Katmandu when we visited in May but never got the chance, we did pass it on the transfer bus though and it looked like fun. Katmandu is located in Magaluf and it is an attraction for the whole family, it has an upside down house, splash park for children, huge soft-play area, mini golf course, high wire rope course and so many unusual things to see and do. You can buy passes where lunch and drinks are included which makes it cheaper too. 10.) Mini Golf Fantasia - Golf Fantasia is in Palma Nova and is a lot of fun, it is set in a tropical garden with waterfalls and fish, birds and turtles. It is a big mini-golf course with three 18 hole mini-golf courses to choose from. Mini golf on holiday is a must and is so much fun for the whole family, even my 3-year-old enjoys a game of mini-golf. We had the most brilliant Majorca holiday 2018 and I really do think that we will be back in 2019 as it is just the most perfect destination for a family holiday. If you have been to Majorca where would you recommend to visit?